Cooler Master SK630 - Keyboard - backlit - USB - US - key switch: CHERRY MX Low Profile RGB - gunmetal BlackThe SK630 mechanical keyboard is a slim keyboard with all the signature Cooler Master features like On-the-Fly Controls and RGB backlighting - but it adds Cherry MX low-profile switches in a clutter-free tenkeyless format. A reduced travel and actuation distance with extra-flat keycaps means you get all the precision and durability of a mechanical keyboard with the slim stylings of a minimalist chiclet keyboard. Add in a refined brushed aluminum housing and understated LED light bars, and you have a keyboard that looks as good as it performs. 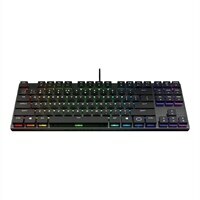 The SK630 mechanical keyboard is a slim keyboard with all the signature Cooler Master features like On-the-Fly Controls and RGB backlighting - but it adds Cherry MX low-profile switches in a clutter-free tenkeyless format. A reduced travel and actuation distance with extra-flat keycaps means you get all the precision and durability of a mechanical keyboard with the slim stylings of a minimalist chiclet keyboard. Add in a refined brushed aluminum housing and understated LED light bars, and you have a keyboard that looks as good as it performs.